So, lately I’ve been really wanting to pull myself and my family further away from processed foods… I know, I know. That is just so trendy right now. I mean, who doesn’t want to pull their family away from processed foods? But gosh- soooooo much easier said than done. Especially for someone who is not much of an accomplished cook in the first place, and then double that for someone whose minimal cooking skills revolve around a bunch of “Cream of _______” dishes. Plus, I’m not much of a hippie type… I mean, I like roughing it out in the country, but only if there is a Walmart within driving distance to get the stuff I need. So, this whole “do it all yourself” thing is gonna be a big switch for me. In an effort to make this endeavor something I don’t burn myself out on too quickly, I have decided to start very small and thought I’d begin with homemade granola bars. I found a recipe on Pinterest that sounded doable and so I modified it a bit and then tried it a few weeks ago. Delish. My processed-addicted 5 year old son loved them. So, I made them again a couple of days ago and bam… nailed it again. I got so hungry at lunch time. Weird, right? What a concept. But it was the kind of hunger that caught me a bit off guard; it sorta came out of nowhere. And I didn’t really have a plan for what to eat nor a lot of easy options… so, I ate… a granola bar. And I sorta sigh and shake my head at myself as I write that. But… what’s wrong with a granola bar, January? Unless… you’re doing a Daniel Fast that restricts several of the ingredients in the granola bar. Unless… you’ve made a covenant with God not to eat sugar for five years and there are m&ms and mini chocolate chips in them. Unless… you’re not eating A granola bar but MANY granola bars. Yep, that’s right… I didn’t just eat one granola bar to ward off my hunger. I ate five granola bars to ward off my hunger. And then at dinner I had the nerve to feel so proud of myself for not eating the BBQ pulled pork I cooked for my visiting brother. And proud again as I just ate enough and felt so satisfied. Well, YEAH, I felt just so satisfied with my little meal… I’d eaten enough oats and peanut butter in those bars to last me a week! This morning, however, I sit here and cross my arms (cause despite it being late April it’s a little chilly) and think… Well, what lesson did I learn from it? A couple, actually. Reminder One: This is a journey, January. By now you should have learned that this whole process of healing and renewal is not going to happen on your timeframe. Calm down. Learn lessons. Keep your eyes on Jesus. Reminder Two: Have pre-prepared, easy to make/warm up lunches for days like these. Like, yesterday was a “I need to nuke it” kind of lunch day. Not even my avocado and tomato salad would have been right for me (despite it’s deliciousness) because it took a whopping five minutes of “work” to make it. So, this week, I’m going to prepare five freezer meals for myself along with a list of Daniel Fast-friendly lunches to glance at when my brain is kaput. Reminder Four: God’s love never ends. His mercies never stop. They are new EVERY MORNING. (Lamentations 3:22-23) And He will give me wisdom to come out of this. He has healing in his wings that all I have to do is reach out and touch. He knocks down strongholds. He reaches down with his strong arm to save. God. is. good. Even my granola bar gorging can be worked out for His Good Plan. Yep. I feel better now! 1. 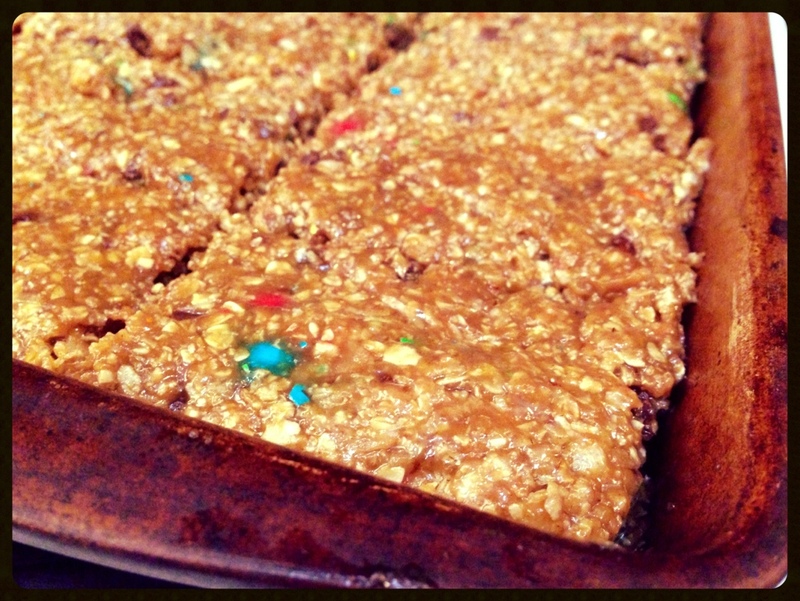 Those granola bars look super yummy. 2. I find lunchtime to be one of the most challenging times of the day. I love the idea of freezer meals ready to go. 3. You can also store chopped veggies in the fridge and have them ready to go for a quick salad. If you like salad. (I get tired of it and don’t eat enough leafy greens.) But I cut up a few extras the other day and then yesterday I was able to throw a salad together pretty quickly for lunch. 4. Thank God for his mercies. I do need to cut up veggies to get ready for salad. I don’t particularly gravitate toward salad… my mind is always like, “Leaves? For a meal? On PURPOSE?!?!? !” But they are easy and a great way to get in raw veggies. And, I always throw some sort of legume on top. Either chickpeas or black beans or both if I’m feeling sassy. they add a meaty texture and chickpeas are packed with protein and other essential vitamins. They’re my fave.